NEW YORK--(BUSINESS WIRE)--LexisNexis® Legal & Professional, a leading provider of content and technology solutions, announced today the launch of LexisNexis Firm Manager® software, a cloud-based product for law firm practice management. The announcement, which was published at LegalTech New York 2014, officially releases the completely re-designed practice management software for independent law firms, after more than a year in testing with hundreds of independent attorneys. Based in “the cloud” the Firm Manager service is especially tailored for independent attorneys and law firms – LexisNexis estimates there are 500,000 practicing in the United States. The Firm Manager service is secure, fast, and easy to use; it provides attorneys with the freedom of mobility and access to the tools and data they need from virtually any device with an internet connection. "Being able to access my data from almost anywhere is a huge convenience for me,” said John Szymankiewicz, Esq., with the Law Office of John Szymankiewicz, PLLC. “It means I can leave my laptop at work some days, but still be able to answer client questions – or field that 11:00 p.m. call when my client needs me." A majority of small law attorneys indicated they are warming up to the idea of using cloud technologies for their firms, despite continuing concerns over data security. More than 72% said their law firm was more likely to use cloud-based tools this year than they were in previous years. The Firm Manager service brings the long standing resources and experience LexisNexis has in serving the legal industry, to provide attorneys with the confidence that their data is secure. “The cloud” simply means that the Firm Manager service is web-based, which provides small law firms with the ability to access and manage their law practice through a web browser. No software installation is required and small law firms can avoid the infrastructure investment costs, such as purchasing servers and hiring the technical staff, necessary to maintain it. “As a solo practitioner, I really don't have the time or expertise to troubleshoot my IT or software issues. I want something that's easy to use and does what I need done,” added Mr. Szymankiewicz. “Firm Manager works for me. I know that my data is secure and backed up; I can access my data from almost anywhere, and I know that the system will work when I need it." Time tracking and billing. The Firm Manager service enables attorneys and staff to enter time and expenses, including fixed-fee billing and trust accounting (through an intuitive slip entry view), create invoices, and review all of the firm’s invoices in a range of views based on an attorney’s preference. Capture unbilled time. Research shows on average, attorneys lose track of more than 30% of their billable time. The unbilled time feature, targeted to be available later this quarter, automatically searches through tasks, meetings and documents created in the Firm Manager application, and flags those that have not been associated with a billing slip for review. Drag and drop document upload. It’s very simple to add documents to Firm Manager for storage or for matter management. For example, attorneys and staff can simply drag multiple files at once in order to add them to a matter. The contents are entirely searchable and the Firm Manager service will very quickly provide a scan to eliminate any viruses, trojans or other security threats. Secure file sharing. The Firm Manager service is powered by WatchDox file-sharing technology which provides enterprise grade secure file sharing. For example, attorneys can share files or entire folders with a client, while maintaining control over who can open, view, edit, copy share or forward the document or documents shared. Permissions can even be revoked after a given file is shared. Universal mobility. The Firm Manager service is easy to access from any device, including smart phones, through a mobile friendly site. This provides attorneys with access to review or search client files, time entry, billing and document sharing whether in or out of the office. 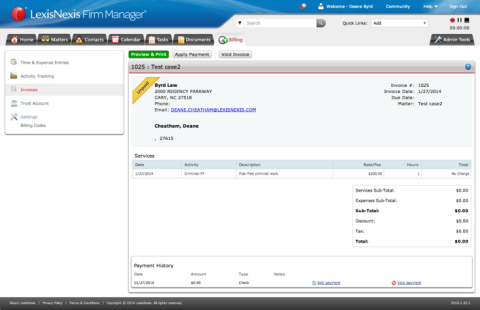 This launch of the Firm Manager service is a new vision of an earlier version of Firm Manager launched three years ago. The Firm Manager team has conducted research with hundreds of attorneys and re-engaged the guidance of a highly reputable customer advisory board. The service announced today has been in essence, constructed by independent attorneys, for independent attorneys and small firms, nationwide. The Firm Manager service is priced on a subscription model that costs $44.99 per month for the first user and $29.99 for every additional user; the service offers a 30-day free trial. A variety of video tutorials and a short demonstration of the service are available on the Firm Manager YouTube channel. 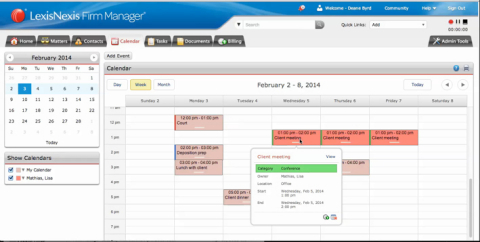 For more information, stop by booth #100 at the Legal Tech 2014 tradeshow or please visit www.firmmanager.com. LexisNexis helps professionals at law firms and legal departments of all sizes manage the business element of their practice or departments with innovative software and mobile solutions for customer relationship management, competitive intelligence gathering and assessment, time and billing management, matter management, client analysis, legal holds and more. LexisNexis launched Firm Manager today at LegalTech, an entirely new cloud-based application for law firm practice management.